James Cameron's Avatar, the GREATEST ADVENTURE OF ALL TIME, is returning to the big screen. After grossing around $750 MILLION in theaters and immediately releasing a no-frills DVD of just the movie right after it left the theaters (with the promise of at least one or two special edition DVDs later on), Avatar is returning once more to confiscate your money in wallet-popping 3-D.
To what do we owe the honor of this grand occasion? Get this: There are nine minutes of video footage that weren't there in the original film, and the world must be allowed to witness these nine minutes on the big screen. The Lord of the Rings movie trilogy was re-released in theaters with extra footage too, you know. Fellowship added 20 minutes. Two Towers gave us 44 more minutes. Return of the King returned with an extra 50 minutes. Let me do some math: Fellowship gained almost 10% more movie. Collectively, the extended versions of the Lord of the Rings movies offered 18% more footage than audiences saw the first time around. 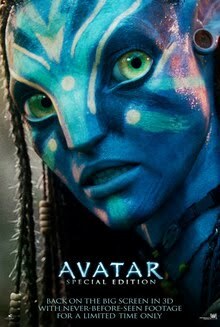 Avatar: Special Edition supplements the original movie by 5%. Whoops; five-and-a-half percent. Once your movie hits the three hour mark, that half a percent gets progressively less meaningful. These nine minutes consist of new and extended action sequences, and little bits added here and there that you might not notice if you've only seen the movie once, which is clearly not what James Cameron intended. I can justify loving a movie so much that you go back and see it again and again in the theater. I can justify loving a movie so much that you buy the DVD as soon as it comes out and then shell out more money for the Special Edition DVD later on because you just couldn't wait for it. I cannot justify paying full price to spend over three hours watching the exact same film you've seen on the big and small screen for an extra nine minutes that weren't included a movie that left theaters barely 5 months ago and will absolutely appear in the Special Edition DVD you've been waiting for anyhow. We paid for more Lord of the Rings because of the quantity of the extra footage. We paid for more Star Wars because of the adjustments to the quality of the film, for better or for worse. Plus, Star Wars hadn't formally been on the big screen for the better part of two decades when it was re-released in 1997. Avatar? Avatar is taking advantage of your fanboy/fangirlism without so much as the pretense of it being for a good reason. Or so it seems to me. Where's my Shirley Temple 3D releases?! GRRRRR!!! Putting the films in color isn't enough; I need 3D and deleted scenes with special effects! And robots! Yes, where are the robots, Avatar? I'm upset now. I think movies should stay in the theaters longer in the first place, and they should periodically show old classics in theaters for the film buffs. But that's a different issue. This definitely reeks of shameless commercialism. They won't be getting my hard-saved dollars. Honestly, I didn't even like Avatar the first time. I know I have to be careful of people showing up at my apartment with pitchforks and torches, but honestly there was nothing *new* about Avatar. The only reason for seeing it in theaters in the first place is for its special effects. I actually fell asleep while watching it when I saw it in the theater. It began as basically another Alien. I mean, the crew went into cryogenic hybernation and Sigourney Weaver was there. There was really nothing to catch my attention in the movie, and I certainly wouldn't pay to see it again in the theater. zharth: Some local/indie theaters show classic movies. There's one downtown that just showed Jaws a few weeks back, and is doing Animal House soon. Avatar, though. The commercialism is palpable, you're right. APN: That was my feeling, too--that there was nothing particularly new. Pretty, yes.